Movie Review - 'Lawless' - For Bootlegger Brothers, A Twisty Path To Profit Adapted from Matt Bondurant's fictionalized account of his vicious family history, Lawless has an overabundance of characters and subplots, says critic Stephanie Zacharek. Its violence is direct, but not its plot. Richard Foreman Jr., SMPSP/The Weinstein Co. Note: Contains language some may find offensive. John Hillcoat's Lawless opens with a scene in which two farm boys urge their younger brother to pull the trigger on a pig that's ready to be transformed into bacon. The boy, whose name is Jack, hesitates and then misfires; one of the older boys finishes the job, neatly and dispassionately. That scene tells you a lot about the character of Jack, played as a young grown-up by Shia LaBeouf, and it telegraphs a lot of information about the movie to follow — perhaps a bit too much. Lawless, which tells the almost-true story of a family of moonshiners in Prohibition-era Virginia, is both too obvious and not direct enough, and its shapelessness dilutes its power. LaBeouf's Jack is the youngest of the Bondurant brothers, an entrepreneurial trio who survive tough times in the rural South of the 1920s by bootlegging. Howard (Jason Clarke) is the eldest, a mercurial, unreadable figure whose wartime experience has turned him into a loose cannon — he's the enforcer of the biz, knocking heads together whenever necessary. Middle brother Forrest (Tom Hardy) is the brains and heart of the operation, level-headed and even-keeled, willing to take risks only when necessary. Jack, the most timid and soft-hearted of the three, is also the most ambitious, and a chance encounter with hotshot gangster Floyd Banner (a minimally used Gary Oldman) only fuels his dreams. He longs for a life of nice clothes and fast cars, though he also has eyes for a meek local beauty named Bertha (Mia Wasikowska), a Mennonite type who cautiously returns his affections, despite the disapproval of her scowling, whiskery father. An even bigger complication emerges in the form of Charlie Rakes (Guy Pearce, denuded of his eyebrows for no discernible reason), a special deputy who brings his own lawless ways to the county. Richard Foreman Jr. SMPSP/The Weinstein Co.
Forrest Bondurant (Tom Hardy) is the most level-headed member of the family criminal enterprise. Jessica Chastain breezes into town as Maggie, a Gal with a Secret and a suitcase full of peach-colored nighties, who's powerful enough to attract the interest of steadfast Forrest. There's also a minor subplot about a feud with another family that's so underdeveloped it raises more questions than it answers. Hillcoat knows what to do with grim material: His adaptation of Cormac McCarthy's The Road had a surprising buoyancy to it, despite the depressive nature of the story. But Lawless needs a tighter grip on the reins. The picture's brutality is vivid and unapologetic — that's one of its strengths. And the austere, ghostly version of the Velvet Underground's "White Light/White Heat" that closes the picture — rendered a capella by Ralph Stanley — suggests an aura of brooding melancholy that the picture never quite achieves. Even Pearce, who hasn't given a lousy performance in years (if ever), is somehow pushed off track here — as a swaggering bad-good guy, he goes beyond stylization into raw caricature. The one actor who emerges quietly triumphant from Lawless is Wasikowska. We all know Chastain is the "it" girl, but Wasikowska — a more translucent, understated presence — has the stealth factor in her favor. She's the kind of actress who opens up air around her, instead of just drawing oxygen for herself. LaBeouf is a limited performer, but in his scenes with Wasikowska he springs to life: His face shows a kind of light that no one else brings out in him. In the movie's most transcendent moment, we see Bertha cradling a fawn no larger than a baby doll, a picture of innocence that might be comical if it weren't so heart-stoppingly radiant. 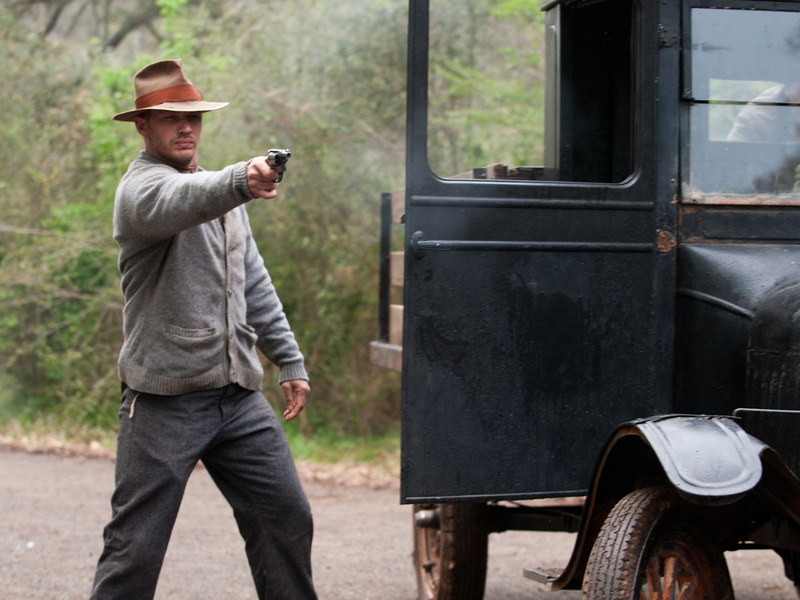 Lawless is mostly about men, but a woman brings it to its knees.